If you’re looking for real estate near or within the Boise area, you’ll want to consider Eagle ID real estate. The City of Eagle, Idaho is situated in the Treasure Valley region of Southwest Idaho between the Boise foothills and the Boise River. The city is located about thirteen miles west of the city of Boise, and It is considered one of the area’s nicer communities. The population of Eagle has grown at the rate of 23 percent over the past five years to approximately 20,000. 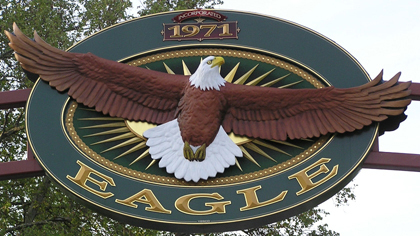 Due to expansion in the Boise metropolitan area, Eagle, like other communities in the area, has become more suburban. The locals have even coined the term “rurban” to describe their community. Eagle, known for its promotion of family values, has a strong goal and family-friendly vision for future growth and development of the city. Most of the neighborhoods have plenty of open spaces for outdoor activities such as horse and bicycle riding. It also has a new state-of-the-art skateboard park, two public golf courses (Eagle Hills and Banbury), and numerous parks for family activities. By design, every new neighborhood subdivision developed in Eagle is required to have parks. Some will have walking paths connecting homes to the Boise River Greenbelt. Eagle is a part of the Meridian School District which has one high school, one middle school, and three elementary schools. Seven Oaks Elementary school, one of those three elementary schools, provides a year-around option for students in grades K-5. There are also two charter schools for Eagle’s students to attend. Eagle offers many family-oriented annual events for the community, including Eagle Fun Days, Fourth of July celebrations, and an old-fashioned Country Christmas celebration. One of those community activities is sponsored by the Eagle Volunteer Fire Department as a fund raiser for the fire department. It has been touted as the “World’s Largest Rocky Mountain Oyster Feed” and occurs concurrent with the Eagle Fun Days festival. In the business district there are several boutiques, restaurants, coffee houses and other small businesses, some newer in construction, but blending well with the original stone buildings of “old town” Eagle. Some attribute the increasing number of new residents in the area to the growing employment opportunities in the town. Besides the employment opportunities within the “uptown business district”, a significant number of its residents are employed in the area fields of professional services, technology, or the sciences and some make the short commute to Boise. Eagle, ID offers a very family-friendly place to live and offers everything from fishing the Boise River to strolling along any number of pathways, biking along the greenbelt, hiking in the foothills, golfing, or eating at one of Eagle’s great eateries. With so many amenities available to residents, you’ll find that Eagle Idaho offers homes in a truly unique place to live, work and play.